As an additional cost to play this event, spend click. The Corp must either discard 2 cards or draw 4 cards. Flooding the system with synchronized request messages makes it unresponsive to legitimate requests. Can the Corp choose to discard 2 cards if they have 1 or fewer cards in HQ? No, in that case they must choose to draw 4 cards. SYN Attack is a card to increase the important-card density of HQ. Assuming you play it correctly it gives the corp a choice between two bad things: remove the two least valuable (since corp chooses) cards from HQ or draw 4 cards and be forced to remove at most X least valuable cards from HQ at the end of their turn, where X is the current hand size (assuming a normal HQ size they can keep 5 but SYN attack plus mandatory draw makes them have drawn 5 after their next mandatory draw). 0 cards in HQ - Corp draws 4 and says "Thank you". Besides being forced to by the rules (see the UFAQ ruling above) it ensures the corp has a full hand at the start of their next turn. 1 card in HQ - Corp draws 4 and says "Thank you". Again, not even a choice. And having 6 cards in HQ after drawing is business as usual. 2 cards in HQ - Corp probably draws 4. With 7 cards on hand after the start of their next turn this is beginning to be slightly painful for the corp if they think they can't use at least one card in their next turn. Still, I expect most corps to choose draw in this case since it's essentially 3 cards for free. 3 cards in HQ - Corp behavior will be hard to predict. After the start of their next turn they'll have 8 cards so they should expect to discard between 1 and 3 cards. 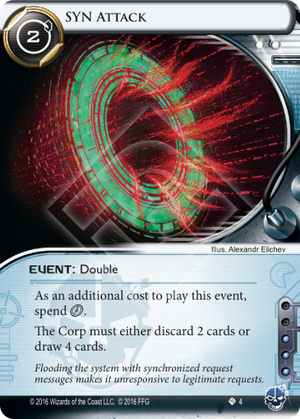 If the corp has weak cards in hand they might choose to draw knowing they have good discard options. If HQ is porous they might want to not draw instead. 4 cards in HQ - Corp probably discards 2. As any Andromeda player knows using 4 cards in a single turn (9 in HQ after drawing) can be tricky and it's even worse if you only have 3 clicks. It's near certain that the corp will have to discard at least 2 cards so there's a strong argument to just take the hit up front. 5 cards in HQ - Corp very likely discards 2. Going from 5 to 3 cards is usually not terribly painful. Having 10 cards at the start of your turn does give a big chance of very difficult choices at the discard phase and the risk of an agenda flooded hand. Needless to say HQ full of agenda's is not desirable when facing a criminal. Of course from 2 cards in HQ upwards there's no guarantee what a corp will choose. That actually can work to your advantage. For example if the corp has 5 cards but chooses to draw you might infer that either they have a hand full of cards that they absolutely don't dare discard (e.g. agendas) or that they're hunting for something in R&D. Regardless of what the corp chooses there is a very large chance that the average value to the corp of the cards in HQ increases. The more the corp has to discard the greater that value increase will be. Note that I say value to the corp, there's no guarantee the cards in HQ will be valuable to the runner. For example Scorched Earth can be very valuable to the corp but has exactly 0 value to the runner, you can't even trash it without help. On the other hand generally the cards the corp really don't want to go to archives are the ones with the most value to the runner: agenda's. As you've probably noticed by now SYN Attack is one of those cards that involve deep thinking by both players. I personally like the trend towards opponent-choice and mindgame cards from a game enjoyment perspective though it does make individual cards less reliable. Any card that gives your opponent a choice requires more skill than say Sure Gamble. If you can find just the right time to play it however SYN Attack can mess with your opponent's plans in a way that's hard to cancel. Just watch out for Jackson Howard.